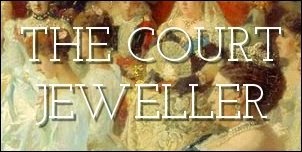 We've talked already on the blog about several of the Queen's major ruby jewels, including the Oriental Circlet and Crown Rubies, the Burmese Ruby Tiara, the Grima Ruby Brooch, and the Baring Ruby Necklace. Today, we're looking at one of her most modern ruby sets: the Qatari Rubies. The set arrived in the Queen's jewelry box in the mid 1980s. Leslie Field notes, "As recently as 1985, on a State visit to England, the Amir of Qatar presented the Queen with a diamond swag necklace with a centerpiece of two large rubies." The Amir of Qatar in question is Sheikh Khalifa bin Hamad Al Thani, who served in that role from 1972 to 1995. The set also includes a coordinating pair of ruby and diamond earrings. The Queen has worn the set on and off since the '80s, sometimes pairing it with the Burmese Ruby Tiara or Queen Alexandra's Kokoshnik.